Make a Pineapple Cheesecake Dessert that will be adored by all! 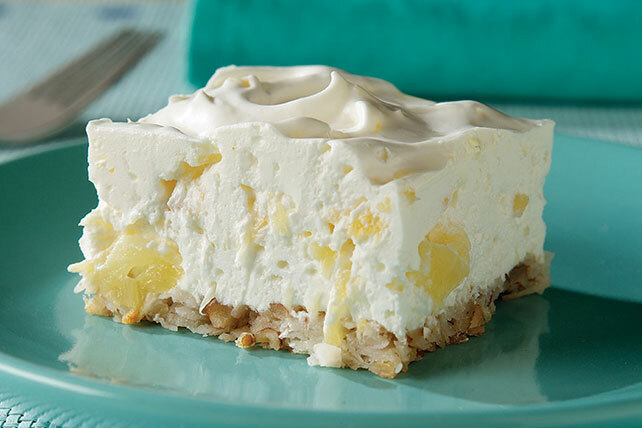 Our Pineapple Cheesecake Dessert features a tasty coconut-and-chopped-pecans crust. Combine coconut, nuts, flour and butter; press onto bottom of 13x9-inch baking dish. Bake 15 min. Meanwhile, sprinkle gelatine over water in small saucepan; let stand 1 min. Cook on low heat 5 min. or until gelatin is completely dissolved, stirring occasionally. Beat cream cheese spread and sugar in large bowl with mixer until blended. Gradually beat in gelatine and reserved pineapple juice. Gently stir in pineapple and COOL WHIP; pour over crust. Refrigerate 3 hours or until firm. At 32 servings, this fun recipe is great dessert to serve at your next party or large family gathering. Prepare using 3 pkg. (8 oz. each) softened PHILADELPHIA Cream Cheese.